I've been coming to Osteria Basilico in Notting Hill for thirteen years. It is my favorite casual spot for Italian food in all of London, and I make it a point to eat here at least once each time I am back in the city. I first discovered this restaurant when I was a study abroad student living in London during my sophomore year of college. After a long morning of shopping on nearby Portobello Road with my parents, we were looking for a lunch spot, but were unfamiliar with the area. I just happened to overhear a conversation on the street where an American ex-pat was telling a friend that she and her banker husband had recently moved to London and their favorite italian restaurant, Osteria Basilico, was only one block away. Thanks to my keen hearing, we scouted it out, were lucky to get a table with no reservation, had a fabulous meal, and have been coming back ever since. ﻿﻿﻿﻿﻿The Osteria is a tiny place on two floors. I like the basement seating as much as the street level, as there is a very cozy, rustic farmhouse feel and candles everywhere. The street level has large windows that look out onto Kensington Park Road. Seating is very close together and come lunch or dinner, there is never a free table, this place is always packed, so make sure to reserve ahead of time. The menu is divided into starters, pasta, meat and fish, side dishes, pizzas and dessert. It is a fairly extensive menu and there is something to please all tastes. I've never had a bad meal here and that is why I keep coming back. I like the fact that all the waiters are Italian, it adds to the authenticity of the place. Last week I ate here with two friends and we sampled many items from the menu. We all started with the special appetizer, which was prosciutto and burrata cheese. Burrata is a fresh Italian cheese, made of mozzarella and cream, and usually served at room temperature. The outside layer is the harder mozzarella, while the inside filled with cream as well, gives a soft and unusual texture. Simply delicious! Next we sampled two pasta dishes. The first was a fabulously flavorful homemade fettuccine pasta served with a veal and rosemary ragu and grated parmigiano reggiano cheese on top. You can never go wrong with a fresh pasta and a warm meat sauce, if it is done correctly, and this one hit the spot. The other pasta was a spaghetti with mixed vegetables (asparagus, tomatoes, carrots), pancetta and scallops in a white wine sauce. I loved the taste of the scallops and the pancetta together and the white wine sauce was both light and delicious. For a meat course, we ordered the veal milanese cutlet with a bed of arugula and cherry tomatoes. The meat was tender and pounded very thin, which is how I like it, and not overly greasy from being pan fried. For dessert, they bring you complimentary cantuccini, or small biscotti, with almonds that are great for dunking into a sweet dessert wine. 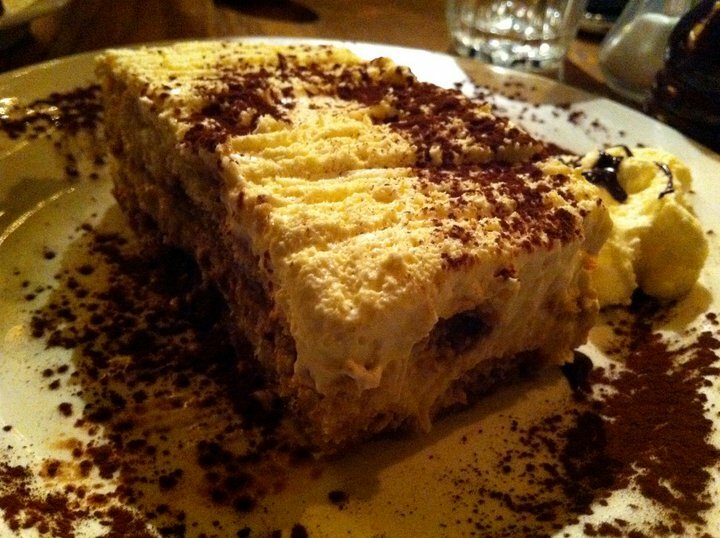 We also had a classic tiramisu with layers of lady fingers, mascarpone cheese, espresso and marsala wine. It was a little heavy on the marsala, but still very enjoyable. 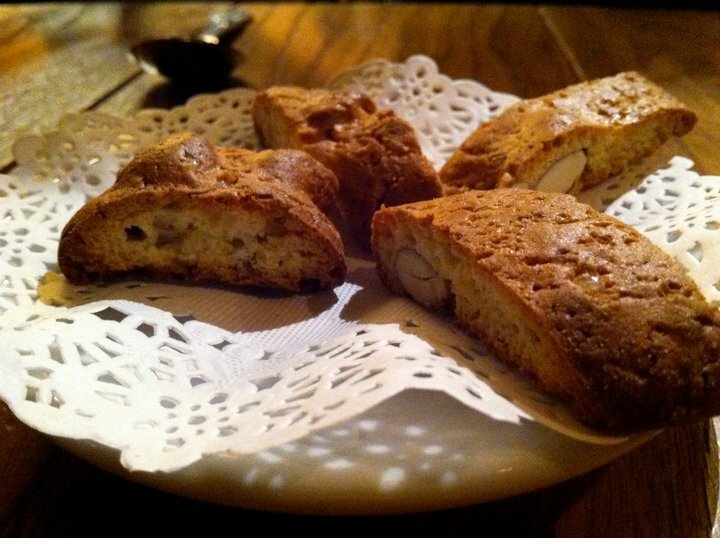 I am already plotting my next visit to Osteria Basilico! As a side note, should they be completely full, they also own two other Italian restaurants on the same road, Mediterraneo and Essenza, that I hear are equally as good.